I hate sale shopping. I always have and I always probably will. I just haven’t got the patience to be scouring through all the racks only to find things that I like that aren’t in my size. If I ever go sale shopping, I’ll always find a million and one things full price and nothing actually in the sales. What I like is online beauty sale shopping, specifically the Space NK sale. Now it was nowhere near as good as last year but it was still pretty good and I got a few bargains. At the top of my list to buy if it went into the sale was the Aromatherapy Associates Ultimate Bath Jewels set. This was originally £50 and as I hoped it would it was added to the sale and went down to only £25. I quickly added it to my basket along with a few other things before checking out to avoid disappointment if it sold out quickly. Luckily though it arrived a couple of days later and I’ve been enjoying them ever since. My favourites are support breathe lavender and peppermint as well as support breathe equilibrium. I have trouble breathing sometimes thanks to allergies and these two really help me to relax and get a better nights sleep. You wouldn’t think it, but you only need a couple of drops per bath and although these bottles look tiny, they last a long time. I’m only just now coming to the end of the giftset I bought last year in the sales. I was running low on toner so when I saw the REN Tonic Moisture Mist in a set along with an eye cream and serum I couldn’t help adding them to my basket. I first tried this back in 2013 and quickly finished the bottle. It’s one of my favourite hydrating toners but when I went to repurchase it was always either sold out or unavailable. It’s taken more than a year for me to finally buy it again and I’ve fallen back in love with it. I haven’t tried the other two products yet but I’m sure I’ll report back with a review. Not wanting to pay £5 in postage I added in a giant tub of Sai Sei Mineral Seaweed Bath Crystals to my order which bumped the total up to free delivery. My final purchase wasn’t in the sale but I couldn’t help treating myself to it as I loved the colours. I’m a sucker for throws and as soon as I saw it I knew this one from TKMaxx would look perfect at the bottom of my bed on top of my grey knitted throw from H&M. It also looks great on the back of my Ikea grey reading chair if I fancy a mix up. 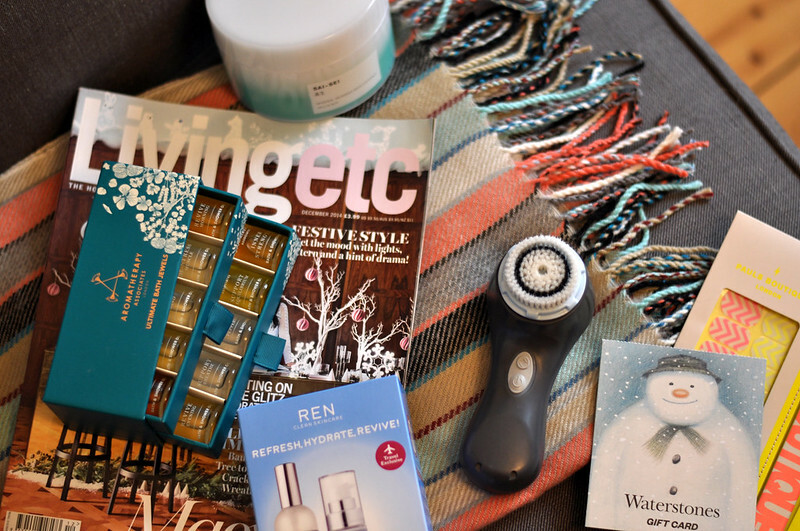 This past Christmas the present at the top of my list was a Clarisonic as ever since I started blogging and these have become more popular it’s been on my wish list. I’ve haven’t wanted to part with my money though as £125 is a lot of money to take a risk on a product that might not even work. Add in all the horror stories I’ve read of how this has broken people out in a really bad way after they started using it also put me off a bit. What better time though to add it to a Christmas List? After seeing it on offer on Feel Unique I then had to decide what colour I wanted. I knew I didn’t want white as I could see it discolouring over time and I thought I’d get bored of light pink or a bright colour so I went with one of my favourite colours, grey and I couldn’t be happier with it. Before my parents ordered it I was emailed a gift voucher from Feel Unique as an apology for a previous order being delayed. The amount was for £35 which I’m still thinking was an error, I got another one for a different order that was only worth £7, but we were able to use it as well as the £25 off offer. Therefore my Clarisonic was only about £70 which I feel a lot better about. As a gift to myself I ordered the delicate brush head as I thought this would be the best type for my sensitive skin. I’ve only been using it once or twice a week so far so I give my skin a chance to get used to it. I’m never going to use it on a daily basis as I know that’ll be too much for my skin instead I’m using it as a treatment to help with dry patches and in the long run to even out the texture of my skin. Did you grab any bargains in the sale? Buy anything from the Space NK sale?